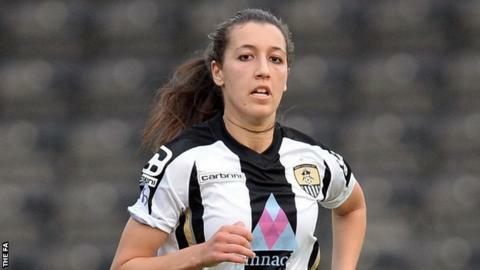 Dunia Susi came off the bench to score twice against Women's Super League Two side Aston Villa as Notts County eased into the FA Cup semi-finals. Villa keeper Caitlin Leach twice denied Ellen White before the England striker eventually lobbed the hosts ahead. Laura Bassett made it 2-0 after Alex Greenwood's free-kick hit the post. Aileen Whelan added the third and substitute Susi netted either side of Kerri Welsh's effort for Villa, who had Emily Owen sent off for two bookings. The second-tier visitors, who equalled their best-ever FA Cup run to reach the last eight, were not overawed by facing one of the favourites for the WSL 1 title. Their well-organised defence restricted Notts for much of the first half, but they failed to create any meaningful chances of their own before Welsh met a long Alicia Robinson free-kick to send a flicked header past Carly Telford. Rachel Williams engineered both of the home side's first two chances, threading enticing through balls into the box, but White failed to beat Leach. However, the former Arsenal striker showed her quality just before the break when she spotted Leach off her line and lifted an expertly-weighted effort on the half-volley into the net. Captain Bassett's tap-in, Whelan's sliding finish and brace of powerfully struck Susi efforts ensured Rick Passmoor's side progressed to the semi-finals for a third successive season. "You have to applaud Aston Villa, their players and management team, because they set themselves up in a way that made it difficult for us to break them down and it worked for 40 minutes or so. "But once we cranked it up a gear we found space and time, and our energy and athleticism got us into positions to create and score. "It was a terrific finish from Ellen White and that enabled us to go into the break 1-0 up and put us on the front foot. The goal ignited us and Villa had to come out and play which left gaps and holes." "The result speaks volumes, but we weren't five goals worse. "We set ourselves up to contain them and we did that until the 45th minute then Ellen White scores a wonderful goal. "In the second half we wanted to keep it tight again and hold them for as long as we could before having a go in the last 20 minutes, but we couldn't do that. We lost a player and were down to 10 and gaps opened up. "The running we did in the first half told and a team of the quality of Notts County found those gaps." Notts County Ladies: Telford, Greeenwood, Buet, Turner, Bassett (F Whelan 73), Walton, A Whelan Crichton, Clarke, Williams (Susi 67), White (O'Sullivan 73). Aston Villa: Leach, N'Dow, Baker, Owen, George, Robinson (Merrick 79), McCue (Crackle 68), Moran, Cusack, Welsh, Wilkinson (Ferguson 71).